in a kingdom-not-so-far away, workers in giant factories were busy making children’s clothes. Away from prying eyes, the workers were forced to use hazardous Little Monsters to help print and dye the garments. began escaping from the factories, swimming out of the pipes to be unleashed upon the world. Some even made it all the way to the North Pole! the small creatures hid in the shoes, shirts and skirts worn by children across the globe. These Little Monsters were causing BIG problems. Some were toxic, while others even had the power to make boy fish become more like girl fish! From the modest outfits of the factory workers' sons to the beautiful dresses worn by the merchants' daughters. From the sporting garments of adidas to American Apparel's fashionable basics, these Little Monsters could be found lurking in the clothes. this is a nightmare!" cried the parents of the world, seeing their children so frightened by the toxic monsters. together to demand that the garment makers ban these Little Monsters from their factories and our clothes forever. In just two years, they convinced 18 important merchants like Zara, H&M and Levis to begin getting rid of the Little Monsters. still needs a happy ending. Merchants like Disney and American Apparel are still ignoring the threat that the Little Monsters pose. by joining the Detox campaign so that the kingdom's children and our rivers may live happily ever after. 2. Tell the companies to clean up their act! Tell American Apparel to eliminate the Little Monsters! Ask Disney to end this toxic nightmare! The latest report by Greenpeace East Asia revealed the presence of hazardous chemicals in clothing items bought from 12 global brands, from fast fashion giants like Primark, to sportswear brands like adidas and kids favourite Disney. Read the full report here. 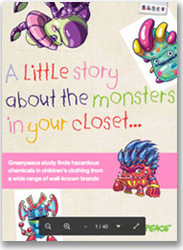 These Little Monsters can be found lurking in our kid’s clothes, escaping from factories, travelling through our waterways and causing mischief all over the world. Learn all about these scary beasts, their terrible traits and their horrific habits in our pocket-sized Guide to the Little Monsters. The Detox campaign has united millions of people across the globe around a shared belief that the clothes we wear should not contain hazardous chemicals or cause toxic pollution. Together, we have been able to convince big brands including Zara, H&M and Valentino to commit to clean up their products and work with their suppliers to ensure that no more hazardous chemicals are used to make the clothes we wear. Our work is far from done, but our successes so far prove that when we join together, big brands sit up and listen. The more of us who act, the faster the change occurs. Sign the Detox Manifesto and join the global movement demanding a toxic-free future.